Setting is the stiffening of the concrete after it has been placed. A concrete can be 'set' in that it is no longer fluid, but it may still be very weak; you may not be able to walk on it, for example. Setting is due to the formation of ettringite and early-stage calcium silicate hydrate. The terms 'initial set' and 'final set' are commonly used; these are arbitrary definitions of early and later set. There are laboratory procedures for determining these using weighted needles penetrating into cement paste. Hardening is the process of strength growth and may continue for weeks or months after the concrete has been mixed and placed. Hardening is due largely to the formation of calcium silicate hydrate as the cement continues to hydrate. 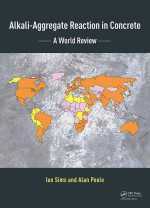 The rate at which concrete sets is independent of the rate at which it hardens. 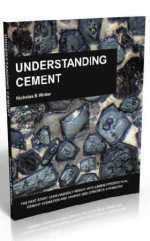 Rapid-hardening cement may have similar setting times to ordinary Portland cement. Traditionally, this is done by preparing concrete cubes or prisms, then curing them for specified times. Common curing times are 2, 7, 28 and 90 days. The curing temperature is typically 20 degrees Centigrade. After reaching the required age for testing, the cubes/prisms are crushed in a large press. While measurements based on concrete cubes are widely used in the construction industry, the European standard for cement manufacture, EN 197, specifies a test procedure based on mortar prisms, not concrete cubes. For example, a cement described as conforming to EN 197-1 CEM I 42.5 N would be expected to achieve at least 42.5 MPa at 28 days using the specified mortar prism test. 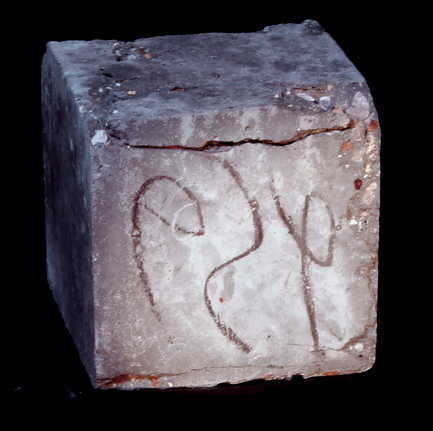 Whether 'real concrete' made from that cement will achieve 42.5 MPa in concrete cube tests depends on a range of other factors in addition to any intrinsic properties of the cement. Concrete porosity: voids in concrete can be filled with air or with water. Air voids are an obvious and easily-visible example of pores in concrete. Broadly speaking, the more porous the concrete, the weaker it will be. Probably the most important source of porosity in concrete is the ratio of water to cement in the mix, known as the 'water to cement' ratio. This parameter is so important it will be discussed separately below. Water/cement ratio: this is defined as the mass of water divided by the mass of cement in a mix. For example, a concrete mix containing 400 kg cement and 240 litres (=240 kg) of water will have a water/cement ratio of 240/400=0.6. The water/cement ratio may be abbreviated to 'w/c ratio' or just 'w/c'. In mixes where the w/c is greater than approximately 0.4, all the cement can, in theory, react with water to form cement hydration products. At higher w/c ratios it follows that the space occupied by the additional water above w/c=0.4 will remain as pore space filled with water, or with air if the concrete dries out. Soundness of aggregate: it will be obvious that if the aggregate in concrete is weak, the concrete will also be weak. Inherently weak rocks, such as chalk, are clearly unsuitable for use as aggregate. Aggregate-paste bond: the integrity of the bond between the paste and the aggregate is critical. If there is no bond, the aggregate effectively represents a void; as discussed above, voids are a source of weakness in concrete. Since alite is the most reactive cement mineral that contributes significantly to concrete strength, more alite should give better early strengths ('early' in this context means up to about 7 days). However, this statement needs to be heavily qualified as much depends on burning conditions in the kiln. It is possible that lighter burning of a particular clinker could result in higher early strength due the formation of more reactive alite, even if there is a little less of it. Not all alite is created equal! For a particular cement, there will be what is called an 'optimum sulfate content,' or 'optimum gypsum content.' Sulfate in cement, both the clinker sulfate and added gypsum, retards the hydration of the aluminate phase. If there is insufficient sulfate, a flash set may occur; conversely, too much sulfate can cause false-setting. A balance is therefore required between the ability of the main clinker minerals, particularly the aluminate phase, to react with sulfates in the early stages after mixing and the ability of the cement to supply the sulfate. The optimum sulfate content will be affected by many factors, including aluminate content, aluminate crystal size, aluminate reactivity, solubilities of the different sources of sulfate, sulfate particle sizes and whether admixtures are used. If this were not complicated enough, the amount of sulfate necessary to optimize one property, strength for example, may not be the same as that required to optimize other properties such as drying shrinkage. Concrete and mortar may also have different optimum sulfate contents. In addition to the compositional parameters considered above, physical parameters are also important, particularly cement surface area and particle size distribution. The fineness to which the cement is ground will evidently affect the rate at which the cement hydrates and therefore the rate of strength growth; grinding the cement more finely will result in a faster reaction. If a cement manufacturer finds that his strengths are decreasing, often the first thing he will do to rectify the problem is to grind the cement more finely. Fineness is often expressed in terms of total particle surface area, eg: 400 square metres per kilogram. 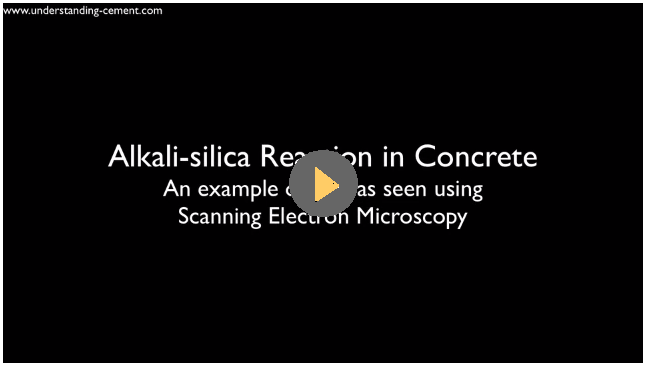 However, of as much, if not more, importance is the particle size distribution of the cement; relying simply on surface area measurements can be misleading. Some minerals, gypsum for example, can grind preferentially producing a cement with a high surface area. 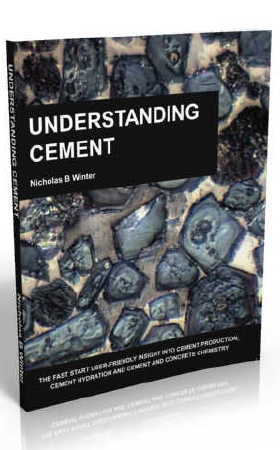 Such a cement may contain very finely-ground gypsum but also relatively coarse clinker particles resulting in slower hydration. 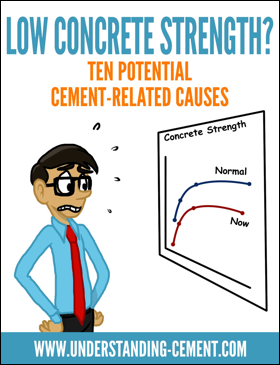 We've just looked at some of the main factors that affect concrete strength. Of course, there are many more, some relating to intrinsic problems with the cement, some of which are quite subtle. 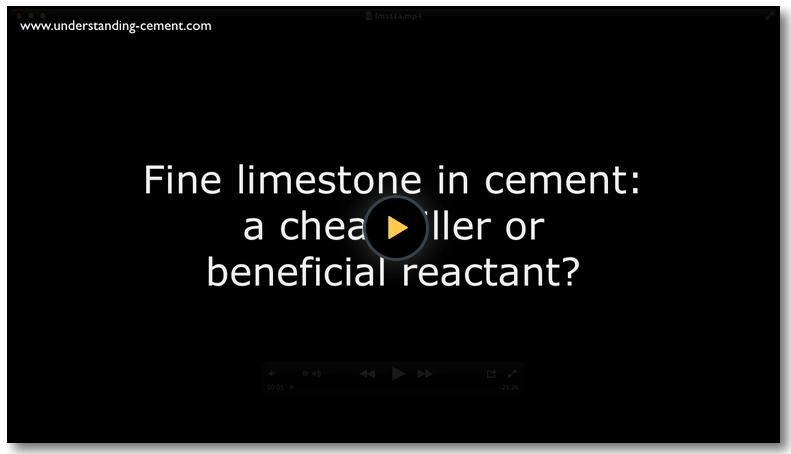 Others relate to how the cement is used, an obvious example being that there is insufficient cement in the mix but there are many others that are rather less obvious. I've written a book on exactly this subject - for more details, just click the cube below.